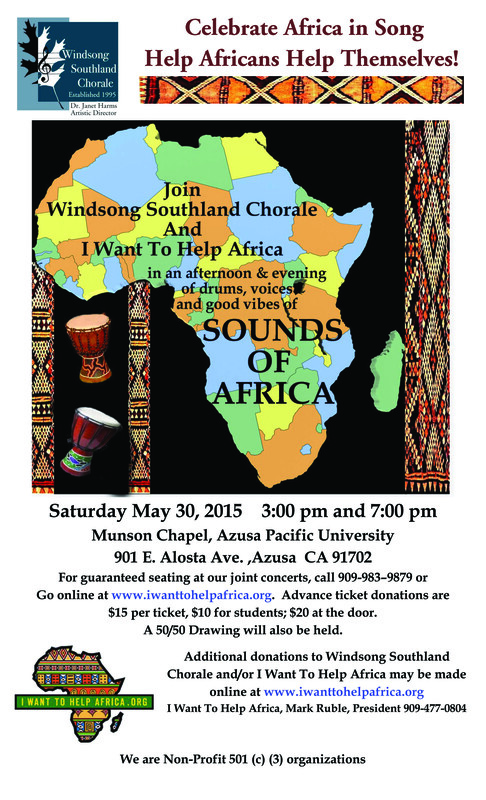 Buy Tickets | I Want To Help Africa, Inc.
Windsong Southland Chorale, based in La Verne, California, and I Want To Help Africa joined together to present Sounds of Africa–a pair of benefit concerts of African music–on Saturday, May 30. The concerts were held at Munson Chapel, Azusa Pacific University, 901 E. Alosta Avenue, Azusa, CA 91702. There was a matinee concert and an evening concert, both well attended.. Sounds of Africa was comprised of all African music that has seldom been heard in the United States. I Want to Help Africa showed a brief video, explaining the work of our organization in Zambia and Zimbabwe. A 50/50 drawing was also held which brought in some much-needed funds. We hope you were able to attend this concert!